You've played a ton of fantasy RPGs, and you've battled undead numerous times, but have you put much thought into the undead? Are they just a spooky monster or is there a story there? In general, ghosts are awesome. A single ghost or small group of ghosts makes for a unique story about an event in the past that has an echo in the present. The connection between the past and present is great for A-plot/B-plot dungeon design, and can serve as either the A plot (the reason the PCs are here) or the B plot (something interesting that they can explore while they're here). Allip: The allip is the mad ghost of a person driven to suicide by madness. This can be congenital mental illness, extreme traumatic stress, grief, or burning guilt and shame. Mad ghosts are terrifying. Banshee: When an elf woman dies after being betrayed by or betraying those she loves, she becomes a wailing banshee. The general idea of the "ghost of a traitor consumed by hatred" is a great story. Ghost: When someone dies with unresolved earthly business they just can't let go of, they linger on this plane as a ghost. There are countless ghost stories out there. Ghosts shouldn't always be evil, though the kind of obsession that keeps a person from passing on to the afterlife is indicative of a dangerous person regardless. Specter: These are the mad ghosts of people who died a sudden, violent death. They're a reflection of the horror and violence of their death. I like thinking of them as people who died in a horrible and sudden tragedy, like a shipwreck, mine collapse, terrible battle, or an orc slaughter. Instead of reflecting the personality the deceased had in life, the spirit reflects the violence and horror they experienced at the moment of their death. They're tragic, crazed, psychotic killers. Specters have varied in difficulty over the years, and in 5e, they're pretty easy foes. That's good, because unlike most ghosts, you'll probably want to use specters in groups to represent the haunt left over by mass tragedies. Specters also make good poltergeists, as the 5th edition designers recognized. You don't have to be translucent and insubstantial to be a ghost. D&D has a bunch of traditional flavors of corporeal ghosts - living humans who have passed on but not left this world. Like other ghosts, each corporeal ghost is its own unique story. Bodak: This ghost is the remains of a humanoid destroyed by the touch of absolute evil. This has cool implications. See the "basically demons" undead below for examples of absolute evil (Nightshades!) that might be good Bodak-spawners. Bodaks are people who aren't killed but instantly corrupted, so they're a sad, twisted, hate-filled version of their former self. In 5e D&D, there are no stats for the Bodak yet. Death Knight: The Death Knight is an awesome image: A powerful loyal warrior who served a dark god dies, and is preserved in death by the god's power. It's the fighter's version of a Lich (see below). Death knights are not really plots in and of themselves, like other ghosts (corporeal or not) are; instead, they're part of a greater plot about the servants of an evil god. Lich: Imagine if you were so afraid of death that you wouldn't leave your body even after it died. A lich is a wizard who figured out how to do just that. They're corporeal ghosts of wizards who used a profane ritual to bind their soul to this world forever, through a phylactery. The phylactery is an excellent plot device, because a lich cannot be killed without also destroying its phylactery. Mohrg: The corpses of truly awful villains who died "without atonement" rise again as mohrgs. It makes more sense to say they "died without justice" -- the villain slain by heroes to stop their evil scheme is not going to become a mohrg. The villain who lives to a ripe old age and dies of a heart attack might be brought back as a mohrg, though. A mass murder who dies in an accident might come back as a mohrg. A villain killed by another villain could come back as a mohrg (but see also Revenant!). There are no mohrgs in 5e yet, but you could re-skin the Revenant. Revenant: The body of a murder victim whose spirit won't leave the corpse until their murder is avenged is called a Revenant. They're not out for justice for the sake of justice. They're out for bloody revenge. So they're pretty awful monsters. They're full of hate and resentment and insane self loathing. Some creatures in D&D are traditionally (or currently) associated with the undead, but are more demons associated with death and the dead than the risen bodies or souls of dead people. Death demons should be connected to stories about thinning boundaries between life and death, foolish necromancers talking to demigods in the shadow world of the dead, or ancient death deities awoken from slumber to consume the souls of the living. Devourer: A devourer was never a human to begin with. It's an undead extraplanar demigod who eats souls. Because it's associated with death and the land of the dead, and it's powered by human souls, it's often categorized as undead in D&D. Devourers are spooky mid to high level villains. There isn't a devourer in 5th edition D&D yet, so consider using the stats for a Vampire, but re-skinning it as a soul devourer and removing the folklore references. Nightshade: Half darkness, half absolute evil made manifest, a nightshade is a curse-demon that comes from Shadow. D&D created a meta-mythology of "shadow" as the energy of entropy, death, decay, and darkness, and it began infesting every setting from Dark Sun to Dragonlance. The Nightshade is one of the creatures made of pure shadow. There's no Nightshade in 5e yet. The Shadow Demon is similar to the Nightshade in theme, but not in power. You can use a Shadow Demon's stats for a Nightshade -- just amp up its power level with more HP, higher Proficiency bonus, more attacks, and some magic resistance to make it scarier. Will o' Wisp: In folklore, the will o'wisp is a bad faerie. In other editions of D&D, it's an extraplanar spirit. In 5e D&D, it's undead. It's not the soul of a dead person, but instead a faerie (or demon) that lures people into the swamp to kill them. There are a few ways corpses get animated in the D&D mythology. First, necromancers can animate the dead to serve them. These monsters are basically constructs, but with a corpse theme. A necromancer plot is a story of a magical mad scientist, basically. The undead aren't the story - they're just minor antagonists in a story about a human villain. Second, when tombs or graveyards are violated (by tomb raiding adventurers, villagers who don't know they're there, evil cults, bandits on the run from the law, etc. ), the gods of good or death will animate the dead to protect the sanctity of the tomb, get revenge on the violators, and prevent further violations. The undead could be the villains, but the source of the problem is human intrusion into the domain of the dead. Third, a powerful curse or celestial event could animate the dead. The story here would be similar to the profaned tomb, but isn't necessarily linked to a graveyard. The bloody murder of a village priest by the town's alderman could cause the dead whose funerals the priest presided over to rise every night until the priest's body is found and their murderer is punished. The horror novel Pet Sematary is an "animated corpses" myth. 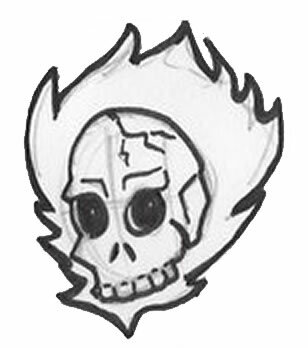 Flameskull: This is an animated burning skull with animal intelligence, and it's almost always the creation of a necromancer. The gods don't like to break corpses up to make them into fire-weapons. Flesh Golem: Technically a flesh golem is not an undead monster in D&D, but it is a corpse re-animated by a magic-user to serve them, so it's not really too different from a zombie. There's a "Frankenstein's Monster" aspect to the flesh golem, though. It's created with alchemy and naturalism gone awry, while the zombie is created by channeling necromantic energy with arcane spells. Skeleton: The D&D skeleton is a set of walking bones held together by magic. A skeleton is basically a medieval robot. In a departure from previous editions, in 5th edition D&D, they're semi-intelligent and not mindless. A distinction between skeletons and zombies is that skeletons are often the corpses of people who died many years ago, while zombies are the corpses of the fairly recently dead. Zombie: We all know about zombies. The D&D zombie is a shambling corpse. It's not infectious, so it's a lot more like a voodoo zombie than a 28 Days Later zombie. It's also like a medieval robot, but a lot stinkier than a skeleton, you'd imagine. Another common undead story is the idea of undeath as a contagion. Because of the threat to D&D player characters, the game features several versions of infectious undead. In addition to classic story hooks, infected undead are defined by their epidemiology. Note that 5th edition seriously modified the traditional D&D epidemiology of infectious undead! So the descriptions below are a bit longer, but they discuss those changes and give advice for DMs on how to make infected undead contagious once again. Mwa-ha-ha! Ghouls: Like the typical zombie apocalypse, Ghouls can spread fast. They're hungry, so they're motivated to go eat. These are your "fast, infectious zombies." Traditionally, in D&D, when they touch you, you can be paralyzed (like people in horror movies who become paralyzed in fear). In 5th edition D&D, ghouls aren't specifically infectious. So where do they come from? Well you can use the ghoul as a death demon, based on the arabic myth they originate from: The ghul is a spirit that lives in graveyards and eats the corpses of the dead. You could also use them as curse-spawned or god-spawned animated corpse undead (see above). But I think it was a mistake to remove their infectious property. Their bite should transmit Ghoul Fever. Ghoul Fever (house rule): A character who dies with Ghoul Fever rises again as a ghoul. At the end of each short or long rest, a character with Ghoul Fever must make a Death Save (regardless of their current hit point total). On a success, the character fights off Ghoul Fever. A failed Death Save works like normal: The character marks off one Death Save. After three failed Death Saves, the character dies and becomes a ghoul, even if their hit point total is positive. Wraiths: Wraiths spread incredibly fast, basically turning a village into a literal ghost town overnight, but unlike ghouls, they can't travel far because they cook in even a little sunlight. They can't just sleep in a ditch during the day like a ghoul. Probably a lot of wraiths created in this manner get destroyed by sunlight because the area gets a little overpopulated, and I bet they squabble with each other over daytime resting places. So ultimately there would be a small number of wraiths haunting a vast, deserted dead area with absolutely no life: No animals. Maybe not even plants and insects. In 5e, a wraith creates specters instead of other wraiths, which fits with a specter's origin story (see above) but doesn't have the infectious quality wraiths had in past editions. Feel free to change it back to wraiths begetting other wraiths. Vampires: These leeches need blood, have some serious Achilles heels, and look totally normal. So they spread slowly and keep a lot of living humans around to feed on. Once they become powerful enough to openly dominate a whole region, like Count Strahd von Zarovich, they stop caring as much about secrecy. Vampires are conspiracies (dare I say... camaraillas?) hidden within human society like parasites infesting a host. Vampires are also a darkly romantic image, with the sexual metaphor of blood drinking and relationship violence metaphor of mental enslavement. Note that the 5th edition designers made vampires create vampire spawn, not other vampires. You can change this: Vampires can make other vampires, but it's a conscious decision. Wights: Wights are super ghouls. Traditionally in D&D, when they kill someone, they come back as a Wight under the killer's control. In 5e D&D, the victim comes back as a zombie under the Wight's control. Basically they're the zombie plague if it was smart. And they're smart. So they keep their spread secret, maybe form into armies or other spooky Deadite / Army of Darkness scenarios. Maybe they rule a valley as god-kings and keep a tribe of humans as their cattle. If you want to keep the 5e Wight epidemiology, that's fine - one Wight forms the villain at the head of a deadite army! But you could go back to previous editions and have a feudalism of Wights, with a "patient zero" Wight controlling a second tier, some of whom have their own sub-Wights.